Villa Paragon is a modern Premier 3 bedroom villa located in the heart of Vila Sol, part of the central Algarve, Portugal. The main living /dining area of the property has French doors leading to the garden terraces. The outside of the villa has a number of shaded areas with comfortable outside furniture and dining table and chairs. There is a BBQ area with traditional barbecue. The garden is mainly laid to lawn, and is totally enclosed making it ideal for children to play in. Guests at the villa will have access to the superb 27 hole (3x9) golf course (which has hosted the Portuguese open on a number of occasions), tennis courts and a Health Spa offering a choice of therapeutic programmes. In the new Vila Sol five star hotel clients can use the hotel bars and restaurants. Additionally, the retail area at Vila Sol is now open, and includes a supermarket, restaurants, an English style pub, and other shopping. The famous Vilamoura resort is only a five-minute drive from Paragon and offers a choice of five golf courses plus all the amenities, bars and restaurants available at the Vilamoura Marina complex. 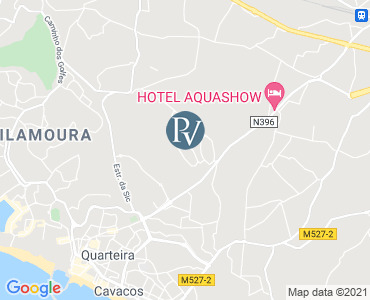 For clients that wish to sample life on the beach, the beaches at Vilamoura are about a 10-minute drive and slightly further afield between Vale do Lobo and Quinta do Lago is the Vila Sol beach Club at Praia do Ancao, a long stretch of soft golden sand. The beachfront restaurant serves an enticing selection of freshly caught local seafood and other local specialities, with excellent wines. The beach has gained an EU Blue Flag and guests can take full advantage of some exiting water sports facilities including tuition. Private swimming pool - approximately 10 x 5m. First and foremost we all enjoyed a lovely holiday - for me it was a chance to revisit a part of Portugal that has very fond memories of childhood holidays and for my husband and daughter it was a first opportunity to visit the Algarve. We struck a good balance between relaxing at the villa and exploring a couple of nearby towns and also eating out. Emma is a credit to your company, being friendly, approachable and knowledgeable. All in all, we could not fault the glorious Portuguese weather and we enjoyed some precious family time in the Algarve. Had a lovely week. A couple of trips to Vale do Lobo - great beach and nice cafés / restaurants and a boat trip to Armona island. Wonderful times at the villa and in the pool. Would definitely come back. Villa Paragon makes for the ideal family holiday destination. It truly is a home from home with a hefty added dose of luxury and relaxation. It is immediately obvious that the owners are themselves a family as they seem to have thought of every little detail and on the rare occasion that there are any small niggles, they are rectified immediately. We stayed in April 2017. The Portuguese sun was very generous to us all week. The pool is just fantastic and such a luxury to have to yourself. There's no need to pack inflatables or pool toys as there is a well-stocked store of equipment for the outdoors. The villa is extremely comfortable and spacious. The addition of a utility room means you truly can pack lightly! The kitchen is spacious and well-equipped and there are a variety of places within the villa's grounds (which are immaculate) where you could eat outdoors. The villa's location is quiet and tucked-away without being isolated. It's worth hiring a car. Airport transfer is really quick and easy; there's a really good supermarket a short drive away and a number of beach resorts to drive to and explore. I'm not really able to comment that much on destinations nearby as we hardly left the villa! It was the perfect place to relax, unwind and just recharge as a family - we have a six year old and a severely disabled two year old. I would not hesitate in recommending Villa Paragon for a holiday, we can't wait to go back! Hi guys just want to say what a fantastic time we had in your villa on the 12th of May. The villa was beyond our expectations absolutely beautiful. The girl Ana that was dealing with us was so warm and inviting. We are looking to book again for September. All prices are per week for the villa only. Villas are booked from 16.00pm on your arrival day (Saturday) to 10:00am on your departure day (the following Saturday). Please note that availability shown is subject to confirmation - please call our reservations team.